A few months ago, one of our dogs came in with heatstroke and were able to reverse it to save its life. When we initially took the dog's temperature, it was 107 degrees Fahrenheit; we don't know if the temperature was actually higher. When temperatures reach this range and are not aggressively counteracted, your dog will surely die. Two months after this heatstroke event, the dog came in and its body cavity was filing with fluids. This is something we will often see in a dog that is in heart failure and the body is not properly working because the fluids are not being absorbed into the body and it is just a mess in the body cavity. There was not very much we could do other than to try and evacuate as much of the pale yellow liquid as possible. On that first visit, we pulled off 2 liters by aspirating it. The dog returned two weeks later filled with fluids once again. We arranged to have an ultra sound done which was not particularly conclusive and showed that the heart and lungs were not affected. The dog continued to build up fluids to the point where it was no longer comfortable to lie down. The adopter advised our veterinarians to euthanize the dog and permitted us to do a necropsy. 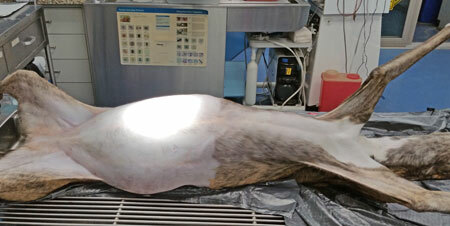 We only had to make an incision into the gut for approximately 2 gallons of fluid to pour out; estimated weight 15 lbs. We found the liver was enlarged and probably the reason for the fluid buildup; the heart, lungs, and spleen were pristine. We rarely see a spleen as normal as this one weighing 4 oz. Did this dog die as a result of the heatstroke event? This writer believes so and is writing this to underline the importance of not letting your dog get into a heatstroke situation. If it shows any of the below listed symptoms, get to a veterinary clinic immediately but always have things on hand to start treatment. A heatstroke kit in your car or home can make the difference between life and death. This kit consists of a large bucket, several towels, and knowing where to get ice and water. At the first signs, get ice and water in the bucket, put the towels in, and cover your dog with the cold towels. In this situation, don't worry about the car, worry about your dog. If you keep the dog covered every 3 minutes with the cold towels, your dog may survive. 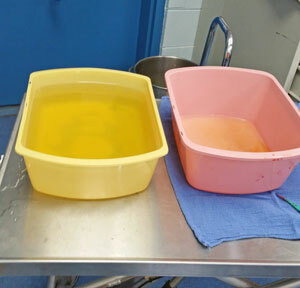 Below are photos of the fluid removal of the dog mentioned above.